Salt is essential for your body to function correctly; simply put we cannot live without it. Today I want to bring to your attention to the massive differences between refined and natural salts. 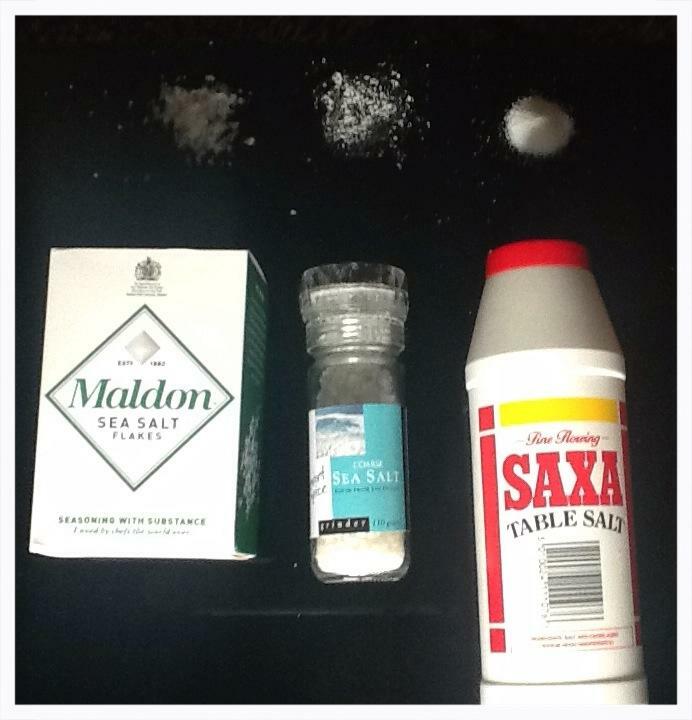 The picture below shows 3 types of salt. The furthest to the right is free flowing table salt; a powdery pouring salt that is full of chemicals to stop it clumping, reading the label I see it has ‘hexacyanoferrate II’, now I don't know about you but if I can’t say it I’m not sure I want to eat it! This common table salt has little in common with natural salt. There will be no suggestion for this as we simply do not need it. The second is a 100% course sea salt which is better for you and wonderfully complements olive oil when grinded onto a salad. I've been reading a lot about Himalayan Rock Salt (pink crystal rock salt) in clean eating books and on line, it’s claimed that it is the purest salt on earth. Personally I've never had it but I will look out for it when I next need to buy salt. Come on health lovers let’s try and use natural salt, there is so much of it about! As long as you do not over use it there is no need to worry too much about natural salt in your diet when eating clean. The majority of salt consumed in the western diet is from processed foods, but as we are eating clean and avoiding processed foods we can use it fairly freely in our cooking. Although if you have a medical condition, such as high blood pressure, you should research from official books and websites or talk to your doctor about how much is healthy for you. Newer PostFrom Wedding chimes to hangover crimes!